Access to justice is an essential ingredient of the rule of law. People need to be able to access the courts and legal processes or the law cannot enforce people’s rights and responsibilities. Access to justice has been identified as an important issue in Australia. The Productivity Commission report in late 2014 makes many recommendations to improve people’s access to the legal system. The booklet focuses on five key case studies, each case study can also be found at the links below with additional study questions. Pro Bono: Mabo and Others v Queensland (No.2) (1992) 175 CLR1. Read the case here. 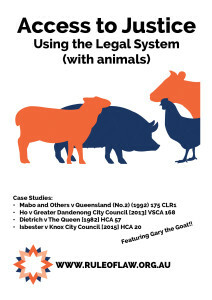 Self Represented Litigants: Ho v Greater Dandenong City Council  VSCA 168. Read the case here. Legal Aid: Dietrich v The Queen  HCA 57. Read the case here. Bias: Isbester v Knox City Council  HCA 20. Read the case here. The Appeals System and Arbitrary Power: Gary the Goat.